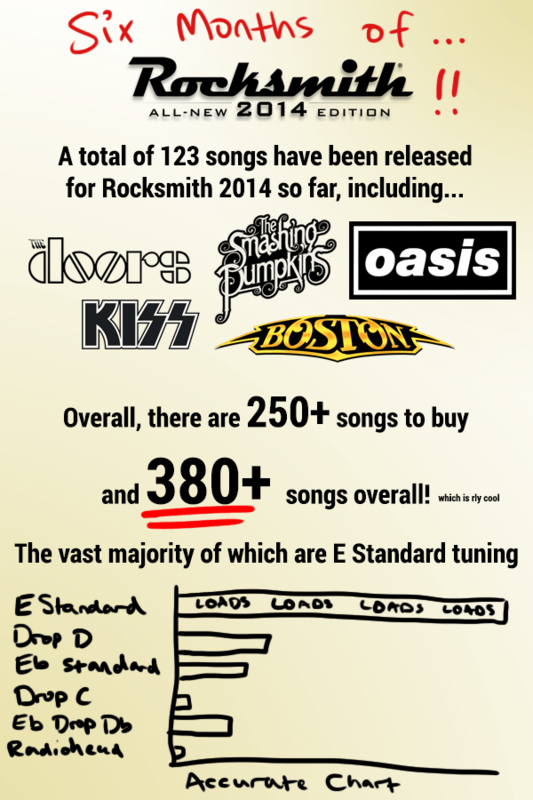 Our good friend @pcgamingisted created this amusing infographic (on r/rocksmith) to mark six months of Rocksmith 2014! Featuring collected stats from the official website and some collected stats via our tuning list, it gave me a chuckle and the 3rd panel is not to be taken seriously. … Please don’t take it seriously. haahaha, I try Trooper once a week -- lol. i’d like to see sales figures, but I doubt Ubi would release those. Funny, haven’t actually played any of the top ten songs even once :p Not that they’re not my taste, they’re just too hard. If you haven’t played them even once, how do you know they’re too hard? I’m not exactly the greatest player yet, but I still make it a point to play everything even if a lot of it ends up being at low difficulty, and in doing that I often end up finding that pushing myself to give harder stuff a whirl helps me improve almost as much as practicing easier stuff to perfection (I was surprised to find out how well I can handle the non-solo-y parts of War Ensemble). In any case, Pour Some Sugar on Me is actually like one of the top 10 easiest songs on the 2014 disc, maybe even top 5. Everlong’s also relatively easy, and Bat Country’s surprisingly easy on rhythm. Just sayin’. Especially the bass arrangement; it was my first 110% song. It only has 239 notes, which averages less than one note per second I think for how long that song is. But it goes to show that the song doesn’t have to be insanely hard to be a good song, btw Def Leppard is my favorite band and I know how to play a lot of their songs, so I know that most of their songs are pretty easy. But pushing your self to learn complex songs is always the best thing to do if you want to get better. Memorizing how to play a song doesn’t make you good, understanding why the guitarist played it the way they did will make you better than most. 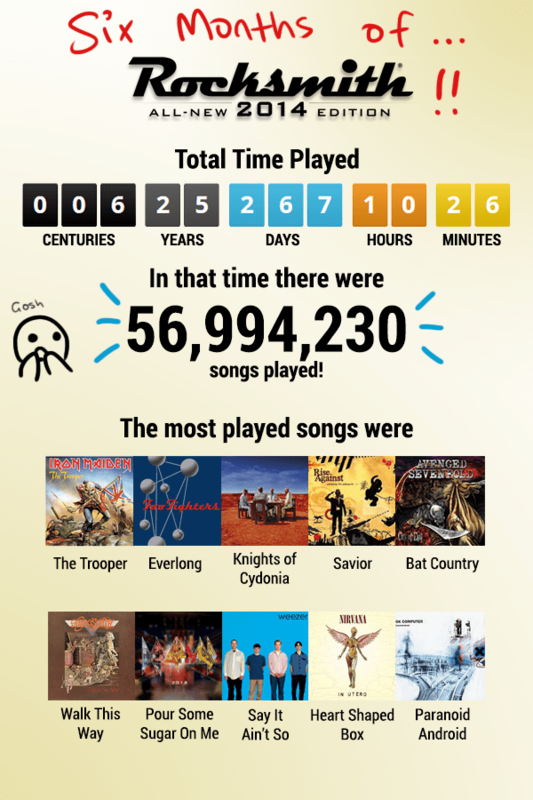 Happy 6-month anniversary RockSmith! Thanks for the Jamz! 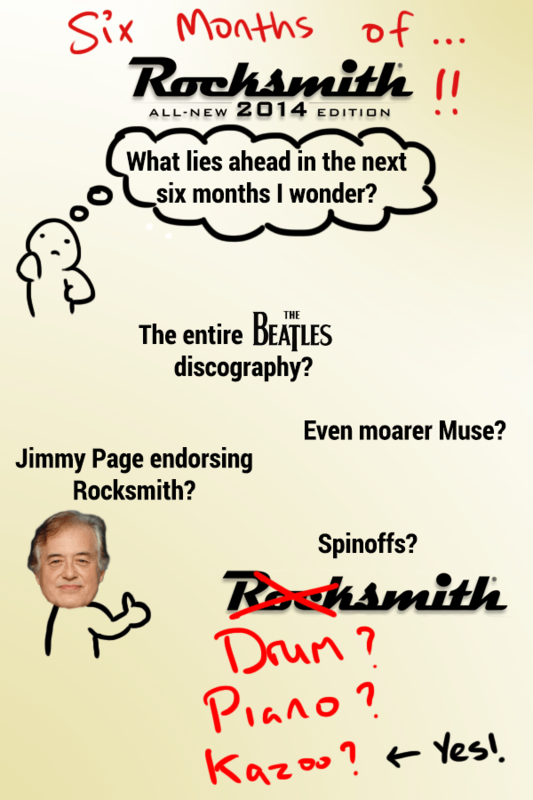 Kazoosmith featuring Led Zepplin, The Beatles, Muse, and some heavy metal band that says “yeah” a lot. How’s about some HarpSmith? Hey it could work! I’m waiting for WoodWindSmith, with Baritone Sax emulation mode.